Posted on August 25, 2013 by Michele D.
My Mother used to make this amazing SnowBall Cake that was such a treat. I even asked for it as my birthday cake once because it was so cool. I started thinking about the SnowBall cake several months ago and did a Google search. How hard could it be to find this recipe right? Wrong. It was very hard. Every recipe I found contained pineapple or some other ingredient that I knew my Mom’s cake did not include. So I called my Mom at the nursing home where she lived to ask her about said cake. She said she was sure the recipe was somewhere at her house and I could look for it the next time I was there. Then she told me the story of how this particular cake recipe made it into her collection. According to her, we had attended a family reunion one summer in Doniphan, MO. This reunion was for my Dad’s side of the family, which is huge, so there were lots of attendees and lots of good food from many different folks. 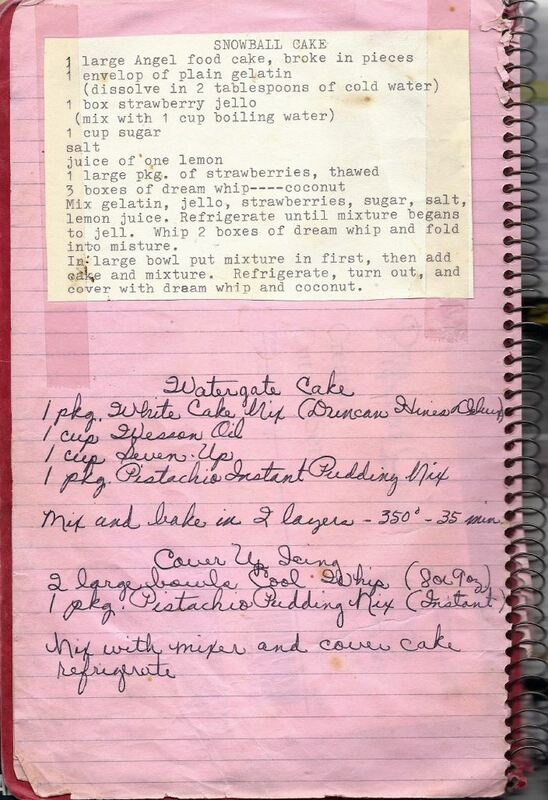 One of my Dad’s sisters had made this amazing cake that looked like half of a snowball so my Mom asked her for the recipe afterwards … and what you see above, is the prized recipe … along with a bonus recipe for Watergate cake in my Mom’s handwriting. This is a good cake as well. I’ve never made the SnowBall cake myself, but I can vouch for its yumminess, and in memory of my Mom, I’m going to attempt to make SnowBall for my upcoming birthday this week. In a way it will feel like my Mom made it for me. Hopefully I can do the cake justice. How about you. Do you have any recipes passed down from your mom that you love to make/eat? Posted on August 7, 2013 by Michele D.
It doesn’t get anymore Kosher Treif than this! Tonight I made myself a Facon, Lettuce and Tomato Sandwich. That’s right. I said it … and it was so delicious! 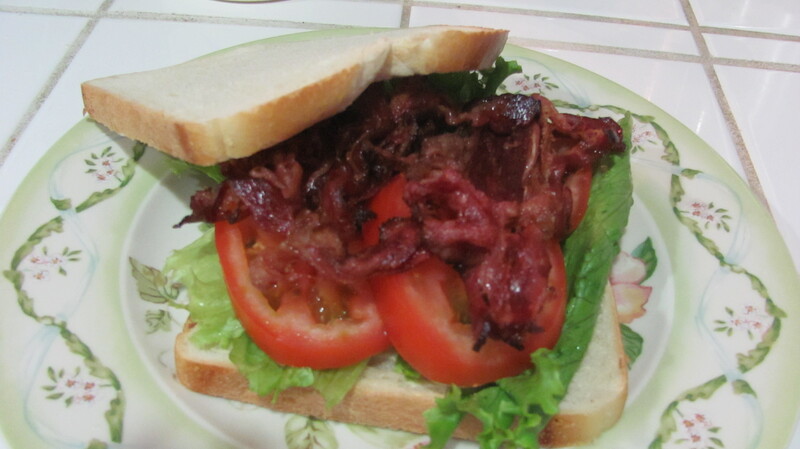 I’ve been craving a BLT for months and when my husband discovered Jack’s Gourmet Kosher Facon at our local Tom Thumb grocery store, I knew I was in business. The Facon is pricey for sure at around $8 for a small package but some times a girl just needs to splurge a little to get her favorite Treif treat. Facon is a little tricky to cook because, unlike real bacon, Facon broke apart very easily when I tried to remove it from the package. Instead of looking like bacon, it just looked like thin strips and pieces of meat cooking in the skillet, but the taste totally made up for the stringy consistency. I fried the facon on medium high heat for about 8 minutes, just until it was crispy and drained it on a paper towel to get rid of some of the grease. Next, I toasted 2 slices of bread, covered both sides with mayo, added lettuce, tomatoes and … FACON … and ate the yummy goodness. The edges of one piece of the Facon were very tough, probably because I cooked it too long so I’ll have to play around with he cooking time but hey, any bacon-like substitute is better than no bacon-like food at all. I ate every bite and was relieved when my daughter said no to my offer to share. 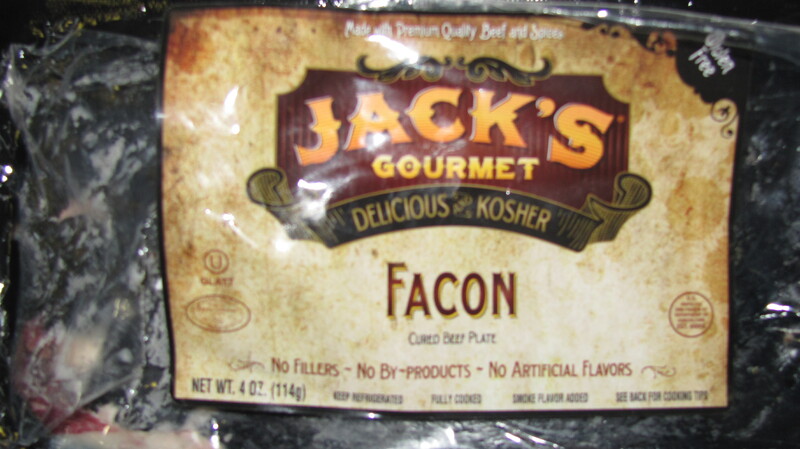 Get thyself to the store today and buy yourself some of Jack’s Gourmet Facon. Then let me know how you koshered-up your treif!